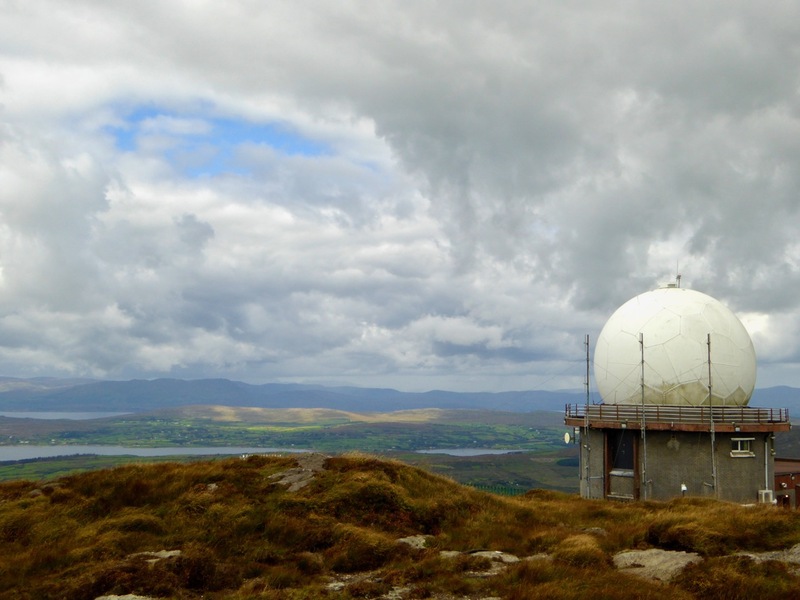 Over three years ago I wrote a piece about the mountain that’s on our doorstep – Mount Gabriel. 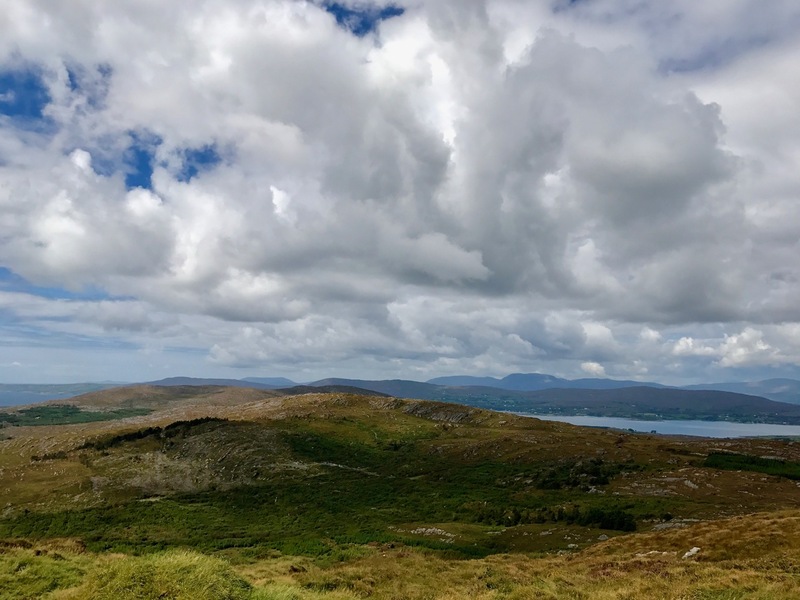 This rocky high terrain is always in our view as we travel around West Cork, and we feel it must have had special significance in prehistoric times: it overlooks a majority of the archaeological sites that we have explored locally – perhaps they were placed because of that. 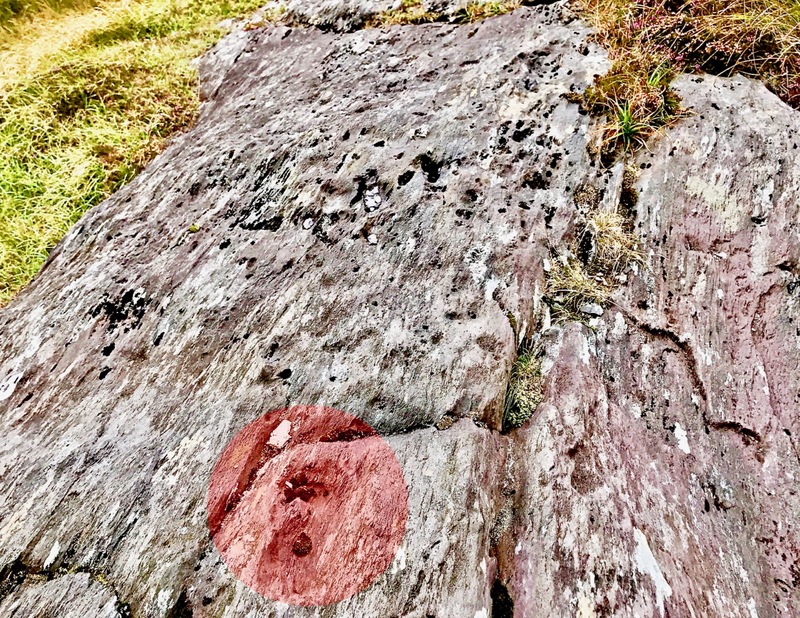 Also, there are many stories attached to Mount Gabriel (find them in my previous post), including the fact that the Archangel himself touched down on its summit and left behind a footprint in the stone! 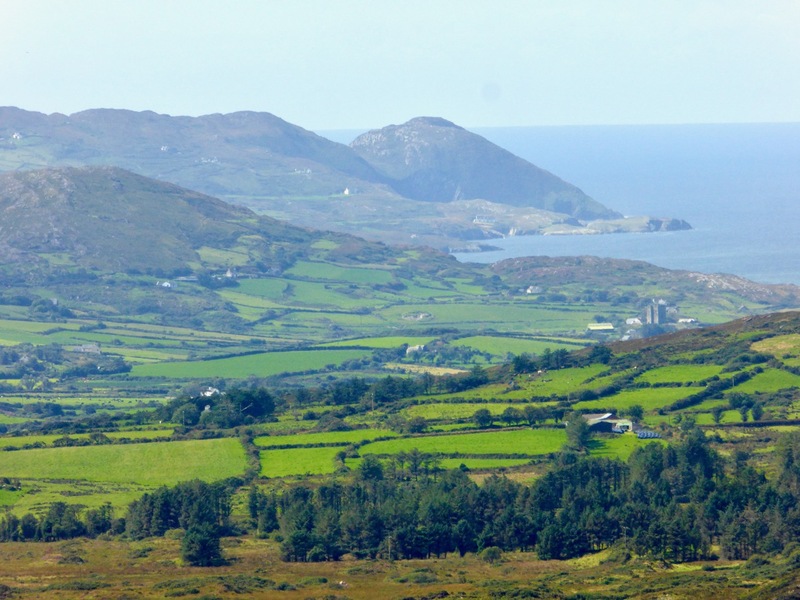 Evidently, he was intrigued to hear about Ireland’s verdant beauty and knew that …in time to come, this honest island would never part with the worship and duty it owes to the Mother of God… and so was determined to get a look at the holy place. 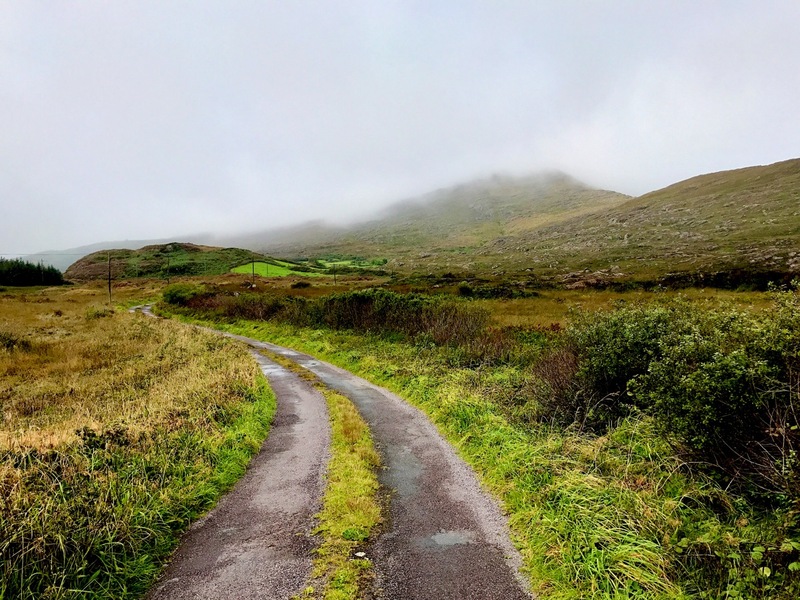 Derryconnell Loop Walk on the Fastnet Trails takes in the foothills of Mount Gabriel – seen here in contrasting weather conditions, but only a day apart! 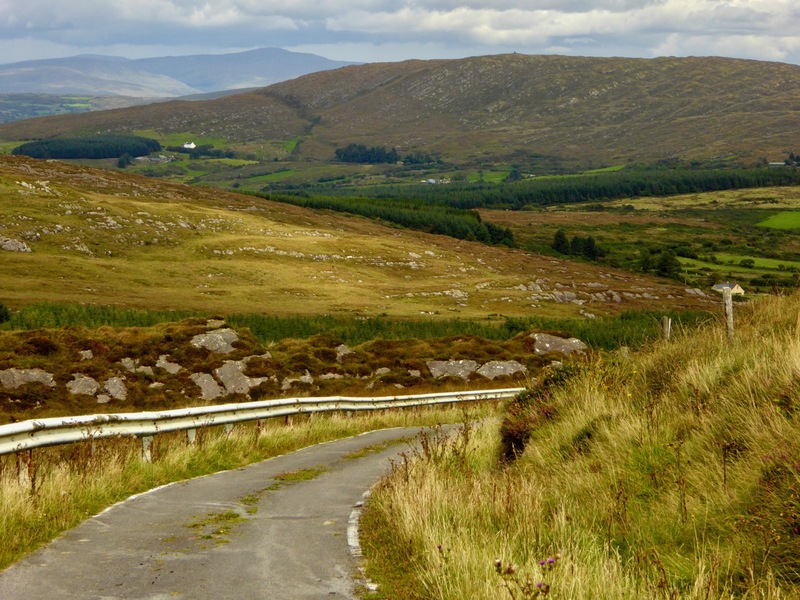 There is a little-known road which runs along the foothills of the mountain which, on a good day, is as beautiful a road as you will find anywhere in Ireland. It begins at the bog of Derreennatra (more of which can be found in Finola’s post today) and you can follow it up and through the Barnacleeve Gap. 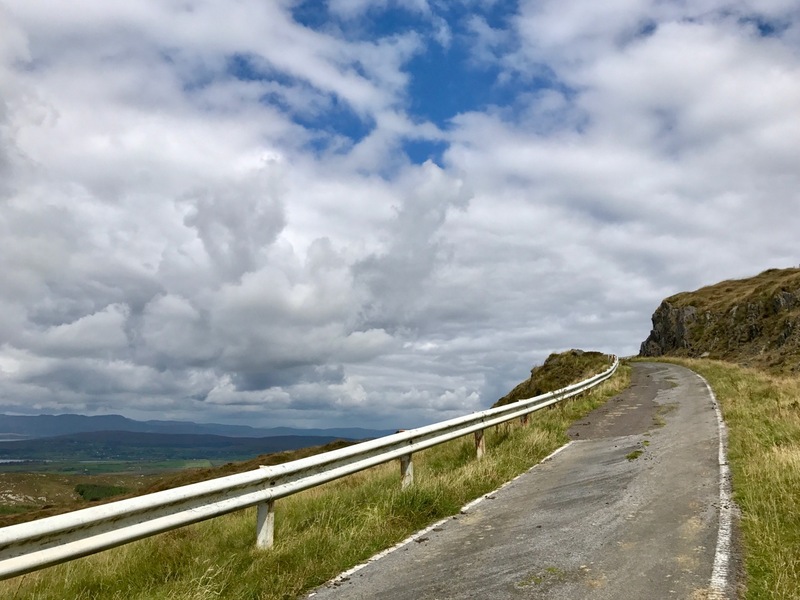 If you wish, from there you can go all the way up to the summit and get some of the most stunning views all the way over the Mizen, across the Sheep’s Head and even into Kerry. 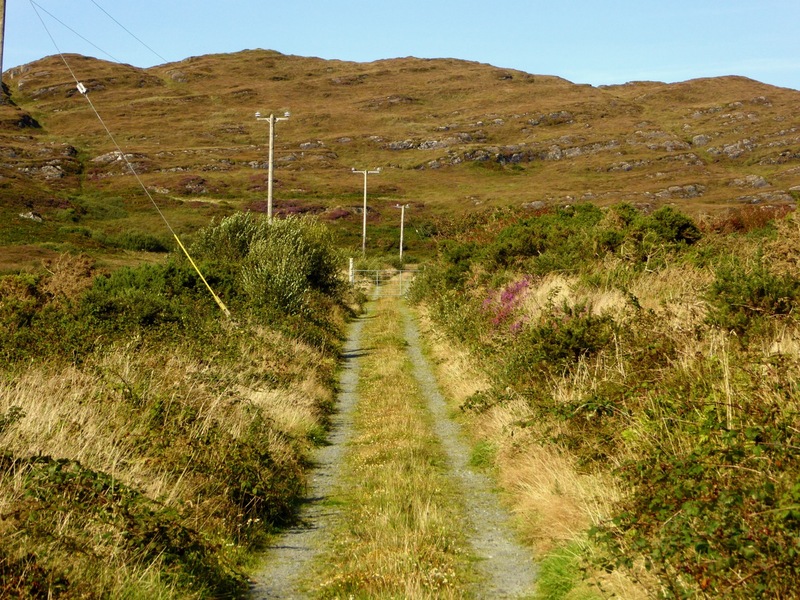 Part of our Mountain Road has been incorporated in the Derryconnell Loop Walk, one of the new group of the Fastnet Trails based around Schull. 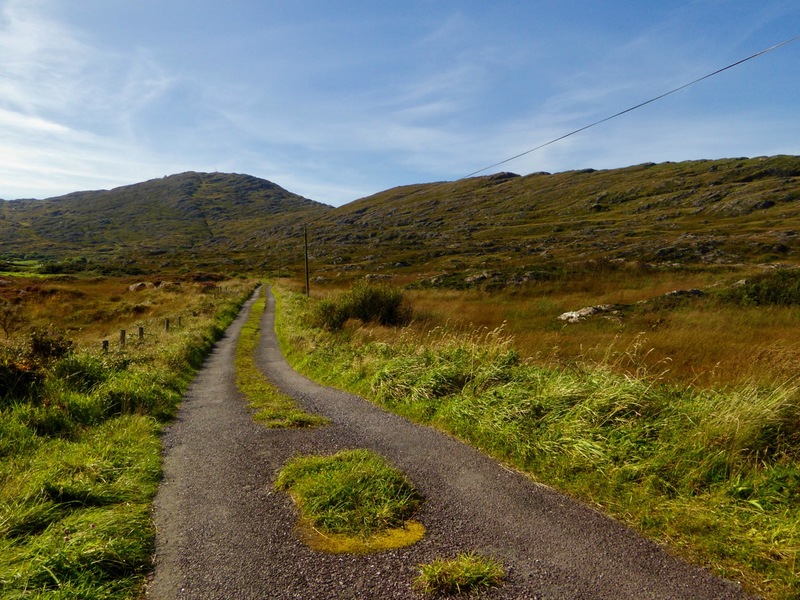 The whole of this loop walk is varied and picturesque, but the section from the bog is outstanding as it skirts the mountain – which always dominates the vista – and brings you to the junction with the Barnacleeve road. 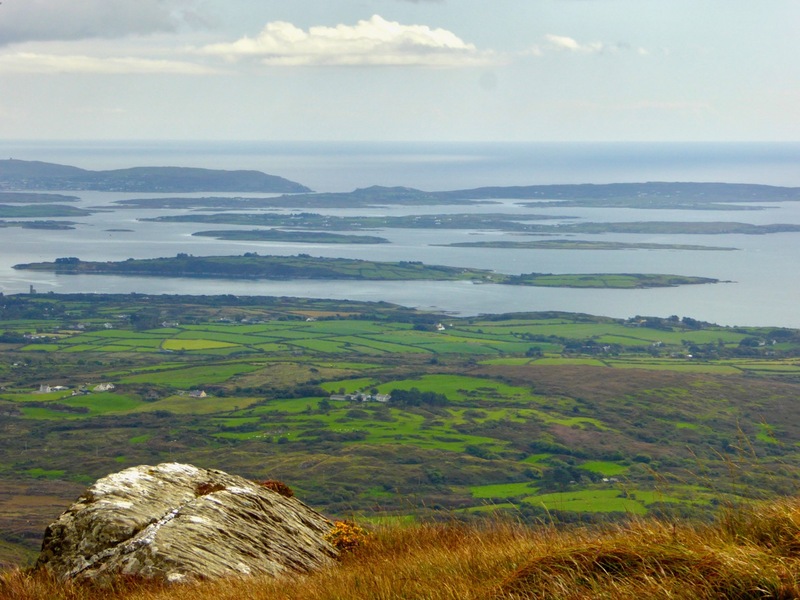 Keep on going, and take in the mountain itself, or follow the trail down to the old Schull Workhouse. Whichever way you go, you will be struck by the seeming remoteness of the boreens, and you will seldom encounter a vehicle. In all weathers the Mountain is engaging: you can start out in the mist and finish up in sunshine! In my younger days I was fortunate to hear traditional Irish musicians Margaret Barry and Michael Gorman performing on the streets of Camden Town, London, when I worked in that city. 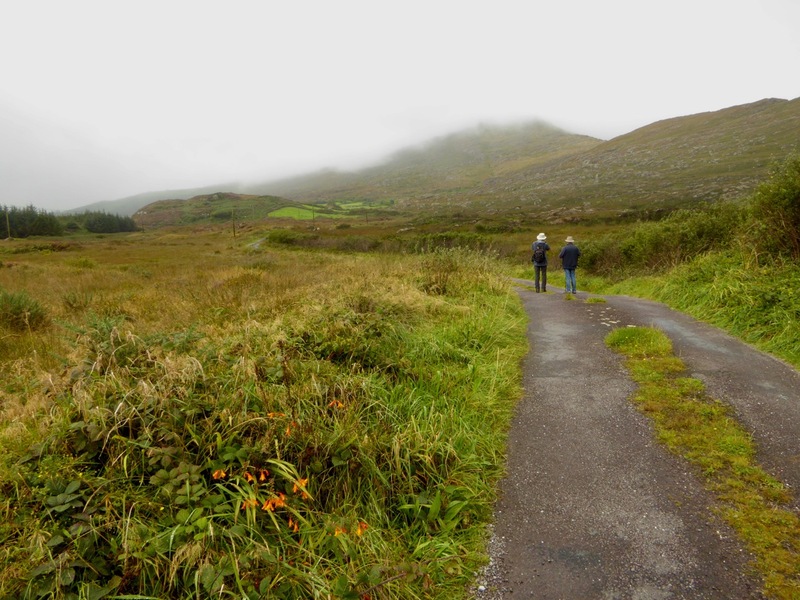 Those streets were a far cry from the home I now have in West Cork, but I recall the duo’s rendering of the tune The Mountain Road: Margaret came from Cork herself, so perhaps our own mountain (or maybe it was Gabriel?) was an inspiration to her. 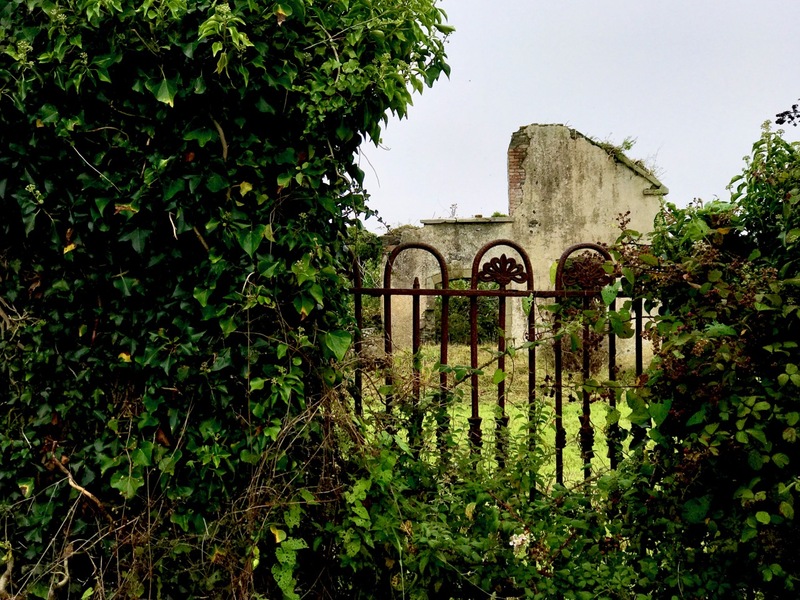 Of all the old ruined or abandoned buildings that dot the countryside of Ireland, one type has the distinction of being the most hated – the workhouse. Many have disappeared: most of the West Cork workhouses have been pulled down or completely rebuilt as community hospitals. A few hints remain – a wall here, a shed there. The workhouse in Schull, although in a ruinous state, has managed to maintain enough of a presence to remind us of its former role in the community. Surrounded by a high stone wall, you can still see parts of the administration building where inmates were admitted, remains of the dormitories and the hospital. We wander around a lot of ruins here in West Cork, but this one is different. No good feelings emanate from these walls. Instead, an aura of decay and sadness lies thick upon the site. We found ourselves exploring in silence, contemplating the misery that was the inevitable condition of those who entered. Workhouses were built throughout the nineteenth century in Ireland. The philosophy of charity prevailing at the time dictated that the workhouse must represent the absolute last resort of the desperate – those who could no longer feed, clothe or house their families or themselves. Once admitted, families were separated and might never see each other again. All inmates were assigned hard labour, although some rudimentary schooling was provided for children. There was no comfort, little sanitation, crowded conditions and meagre allowances of food. The Irish Workhouse Centre in Portumna has an excellent website if you want to learn more about the Irish context, but the site that dwarfs all others in the sheer amount of information is The Workhouse: The Story of an Institution, created and maintained by Peter Higginbotham. He makes the point that not all was bad about workhouses, that many workhouses in Britain provided inmates with sanctuary, life-saving treatment and skills. This is not their reputation in Ireland, however, where their memory evokes dread and abhorrence. Part of this is rooted in their response to the Great Famine of 1845-49. Established to provide Inside Relief many of them initially turned away those who came to the gates asking not to be admitted but to be fed. For those inside, conditions at this time were appalling. As an example, the Durrus History Blog records the report of a Dr Stephens on a visit to the Bantry Workhouse in 1847. The workhouse in Schull was not built until 1851, in the aftermath of the Famine. It was burned down in 1921 during the War of Independence (there’s an account here), as were many workhouses, to prevent it being used as a barracks by the British army. When the Irish Free State was established, one of the first acts of the new government was to abolish the despised workhouse system and transfer its responsibilities to a new Ministry of Health. Because all Irish workhouses were designed by the same man, to one plan, you can get a better idea of how the Schull workhouse might have looked on Tarquin Blake’s brilliant Abandoned Ireland website. An exception to this sameness was the Durrus Grainstore, pressed into service as an auxiliary workhouse at the height of the hunger for a couple of years.